The day has finally arrived, and FFG has saved the best for last. 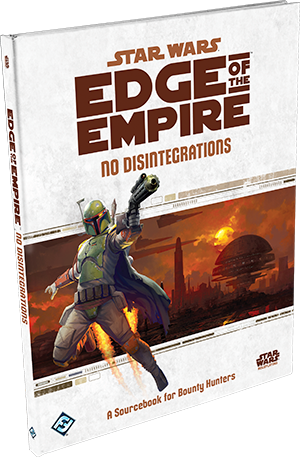 No Disintegrations, the last career sourcebook for Edge of the Empire has finally hit the shelves, and it was worth the wait. This book follows the now very familiar three-section format. The first details new race and specialization options, the second focuses on gear and vehicles, and the third provides GMs with adventure ideas focused on the particular career. As someone who has been running plenty of bounty hunter games, I was eagerly awaiting this release over any other in the FFG RPG line, and it does not disappoint. First up: new species. The Devaronians debuted in the Force and Destiny book, Nexus of Power, and are the devilish looking aliens first seen in the Mos Eisley cantina scene. Most notably, the species possess two livers, and add an automatic success to Resilience checks they make. Don’t get in a drinking contest with the devil. They also start with a 3 in cunning which will serve them well in a bounty hunting role. The other two races are new additions to the FFG Star Wars system: Clawdites and Kallerans. Clawdites are known for their shape-shifting doppelganger abilities, as showcased in episode II of the movies by Zam Wesell, the Clawdite hired to assassinate Padme. Mechanically, to change their appearance from their natural somewhat reptilian look, they suffer 3 strain and make an average Resilience check. Starting out with a rank in Resilience as their other species feature helps. These guys start with a 3 in cunning as well, and with their Changeling ability, offer a very compelling option for a bounty hunter. Kallerans were introduced in the Kanan: The Last Padawan comic. They can breathe through their skin which presents quite the paradox: they are strong but fragile, starting with a 3 in Brawn but only adding 8 for their initial wound threshold. Compare this with a Wookie adding 14 to their initial wound threshold and it is tough to make the case for a Kalleran PC. They have hypersensitive antennae which provides them with a rank in the Heightened Awareness talent, so could make an interesting force-sensitive PC, but seems like an odd choice as a bounty hunter. New specializations in this book include the Martial Artist, Operator, and Skip Tracer. Martial artist has a lot of interesting talents focusing on unarmed strikes and parrying in melee and brawling combat. Clients often pay more for live acquisitions, though this particular specialization may appeal to more than just bounty hunters. This may be a compelling choice for smaller parties that require more well-rounded PCs instead of specialists. To the core bounty hunter skills of Athletics, Brawl, Perception, Piloting (Planetary), Piloting (Space), Ranged (Heavy), Streetwise and Vigiliance, Martial Artist adds another Athletics, Brawl, as well as Coordination and Discipline. Your key attributes would certainly be Brawn followed by Agility, but this would make you a good pilot and a good shot in addition to being the muscle. If you are looking to create an all bounty hunter group with highly specialized PCs, hand the piloting keys over to the Operator. They add Astrogation, Gunnery, as well as additional ranks of Piloting (Planetary) and Piloting (Space). With a nice mix of talents from Ace:Driver and Explorer: Navigator, your key characteristics would be Agility followed by Intellect. Talents like Debilitating Shot allow the operator to disable vehicles with gunnery checks, as well as Shortcut and Improved Shortcut making them superior racers and ideal during vehicular pursuit of an acquisition. The Skip Tracer may be the most versatile of all three, but it is also the least focused. They add Cool, Knowledge (Underworld), Negotiation and Skulduggery, all new skills to the bounty hunter tree with two out of the three relying on Presence. With talents like Bypass Security, Good Cop, and Hard-boiled this would make a solid choice as a leader for a bounty hunter group, and certainly who you would want in the room while negotiating the contract, but suffers from being a Jack of All Trades, Master of None. This would be a fun choice for a small group focusing on investigations/noir kind of adventures, but it will take a lot of experience before they are as good as a larger group with more specialists. Ideally, you would want a 3 in Presence, Agility, and Cunning, which will give you a good pool for most of your career skills. The two signature abilities are Always Get My Mark and Unmatched Devastation. Always Get My Mark is a narrative ability that basically fast forwards the plot until you start an encounter at your mark’s location. The book mentions the inherent issues with this as it has the ability to essentially skip the majority of an investigation/pursuit adventure and suggests this will always be a negotiation between the GM and the PC. I guess it could be cool, and I’ve never had a single character long enough to buy into one of the narrative signature abilities, but it doesn’t do a whole lot for me as a GM. It seems the cons far outweigh the pros. Unmatched Devastation is the more combat-oriented power, allowing a PC to make an additional combat check against the same target with increased difficulty and must be made with a non-ship/vehicle weapon not already used this turn. The “there was a firefight!” (NSFW language) scene from Boondock Saints immediately jumps to mind. With upgrades you can choose more targets and draw more weapons as well as move as an incidental for two strain. This ability would certainly allow a notorious bounty hunter to carve through crowds of mooks and create some truly memorable battles – especially for well-armed, outnumbered hunters. Now to the gear! The second section of the book is definitely the highlight for me, as we now have official stats for Mandolorian armor and attachments, a few nice rifles, and five flavors of mini-rockets for either under-rifle launchers, pistol or wrist mounts: Anti-Armor, Explosive, Flechette, Incendiary, and Ion. There are also rocket attachments to increase range and improve accuracy as well as adding the Guided quality. They are awesome! There are a couple of melee weapons, including an ion pike that only does ion damage, but does 10 pierce 4! That would be a must have for a droid bounty. There are a few new interesting armor types, but of course the most intriguing is Mandalorian Armor with its five hard points. Armor attachments include micro-rocket launcher, integrated holsters, and repulsor-assisted lifting which reduces encumbrance so you can add more stuff! There is so much great gear in this book: holonet homing beacons, rocket boots, a holographic disguise matrix… the gear section is amazing. But that is only half of it! 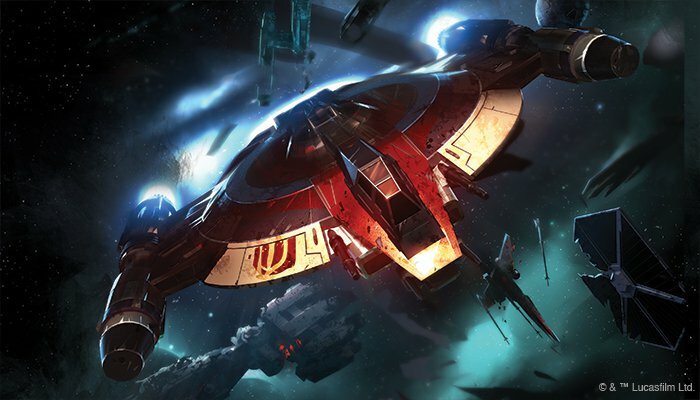 In a brilliant stroke of brand synergy, the ships and vehicles section gives you EotE stats for almost every Scum ship in the X-wing miniatures game, since that faction is made up of all the famous bounty hunters from Star Wars. It stats out IG-88’s Aggressor Assault Fighter and provides a mechanic that makes it more maneuverable with safety limiters turned off, which causes 3 strain to organics, but only 1 to droids. The signature craft of 4-LOM and Zuckuss G1-A is provided as is the Kihraxz star fighter, YV-666 Hound’s Tooth and the soon-to-be-released C-ROC scum capitol ship. It also stats out a few ships from recent Rebels episodes like the Mandolrian Protectorate starfighter and the Shadowcaster. The vehicle attachments include a minelayer and six types of mines! Unlike typical weapons, mines require a hard Piloting (Space) check and their damage equals the base for the mine plus uncancelled failures. Uncancelled threats can be used to trigger various qualities for the different types of mines. The third section of the book is focused on the GM, and includes a lot of information for running investigations (which a lot of bounty hunts could certainly be) this is almost word-for-word identical to the section in Force and Destiny Endless Vigil, which is a bit disappointing. They do go into a bit more depth towards the end about creating obstacles and transistions between scenes, as well as creating an investigative campaign. If you were interesting in building these types of adventures and could only own one, I would certainly recommend this over Endless Vigil. 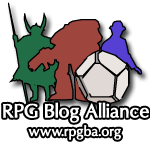 Beyond that, there is some specific information for what benefits and risks go with being a guild bounty hunter as opposed to freelance, and outlines a few example investigative campaigns. The book ends with a section on rewards for different types of bounties and provides a table of sample bounties and modifiers in addition to exploits. Exploits provide a mechanical benefit to the bounty hunter based on performance after bringing back a Major or Legendary target. Some of these include: Humane: boost die to negotiation checks for bounties, but setback die for coercion checks about physical violence. Professional: may ask for a 10% advance on the next bounty after delivering a target within three days. Oppressor: hunter was a part of the rebel alliance or affiliate organization – adds 10% to bounties posted by the empire and increases the difficulty of social checks with rebels once. Bottom line: This book is epic and amazing. If you only own one sourcebook for Edge of the Empire, this should be it.